The United States of America is a country in which every child, female and male, between the ages of 5-18 years-old is given the opportunity to a free, public education. As such, there are certain requirements made of public schools by state governments in order to ensure students are getting their educational needs met and students are being prepared to go out into the world after school and perform jobs that contribute to the economy and society. With that in mind, given that we are now living in a world where technology, inquiry, collaboration and creativity rule, these things must be integrated into the classroom. A fundamental requirement in making this possible is that every student have access to their own device. My research began with me looking at how to engage my ELA students and how to encourage them to have grit. Click on the title for a link to my original paper, Student Choice: Its Effect on Student Engagement and Grit for ELLs. However, it soon became evident that none of this mattered if they didn't have the tools they needed to succeed, which in this case was a working device. Click on the slide below for a concise slide presentation of my findings. Harvest Middle School, Napa opened in 2002 on an old school site. The site was re-opened having closed in the 1970s, due to the increasing demand for schools in Napa County. In 2014 it began the process of becoming an International Baccalaureate (I.B) World School which in 2016 became a reality. Part of being an I.B. school as well as fulfilling 21st century requirements caused the school to want to become a one-to-one device school. In the 2014-2015 school year, the school launched a Bring Your Own Device (BYOD) program - in which students were required to Bring (their) Own Device each day to school and teachers were required to teach as often as possible using devices. To support this new system, each classroom was given a computer cart containing 20 computers. This meant that assuming approximately 10-14 students brought their device, everyone in class would have one. In order to help families procure a device, NapaLearns, a local non-profit agency teamed up with the school and ran a program in which families could cheapily purchase or rent a device, and the school gave devices on loan to students to families receiving school lunches. However, unfortunately there were a few problems with this new system which was implemented very loosely and with very few guidelines for teachers. Some teachers had sign-out/sign-in sheets for the devices, others did not and devices were lost. Some teachers were strict about sign-in/sign-out, some were not. Some teachers left their carts open even when guest teachers were on campus, others did not. By the end of the school year, several of the school devices had been damaged, broken or lost, and knowing that devices were pretty much always available to borrow from the computer cart in the classroom, less and less students bothered to bring their own device as they were cumbersome to carry. Despite each classroom having 20 classroom computers, students regularly had to share and to prevent that, there was a lot of borrowing from other classrooms and frustrated teachers yelling at students to bring their devices, so they could teach their curriculum. In the 2015-2016 school year, the school started the year with a new system. The new system was a 100% B.Y.O.D program and each classroom had just three devices. The thinking was that if students knew they could not just borrow devices any time they liked, they would be more inclined to bring their own. Like the previous year, the school worked closely with NapaLearns to create an affordable system for students whose families could afford it and gave free computers on loan for the year for those families who could not. But, things did not go according to plan, and again, by the second part of the year there were often 10+ students without devices, frustrated teachers and the system was broken, hence my decision to look at the details of how to make BYOD a successful program. In order to fulfill the mandate of the Williams Case which requires that every child is given the tools they need to succeed, HMS needs to come up with a system where students want to bring their devices, and when they are broken or forgotten, students may borrow one. - there must be a system in place for students to be able to borrow a device while theirs is being fixed. Last year, students had the option of borrowing one of the three classroom devices. This lead to students running around school and going to other classrooms to borrow devices which ate into precious class time, disturbed other teachers, caused difficulties with campus security, and more often than not the students came back empty handed. 2. Uncharged / Forgotten - there must be a system in place for students who forget their computers or their charger to charge them. Having three spares in a classroom is inadequate. 3. No Device Purchased - there were a handful of families, who despite being spoken to during the school year, simply did not purchase or organize a device for their student. Below is a poster summarizing my project. ​You are welcome to download it. For more examples click on pdf to the right. The pdf contains 12 pages of reasons taken over a period of two weeks from three teachers. Note: teachers and students names have been removed for confidentiality purposes, but were gathered in order to be able to follow-up with at the time. Click on the logos below for links to their websites. Click on the interview buttons for thoughts and information from the experts. 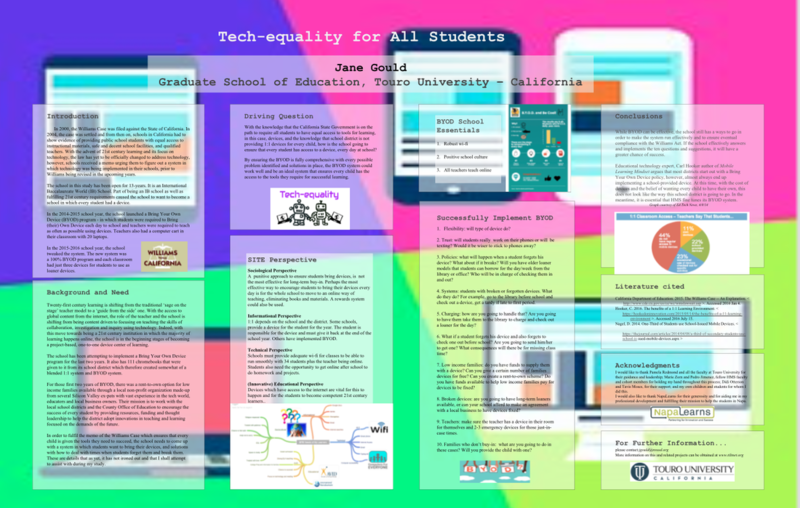 NVUSD Technology department truly believes in preparing all of its students for the 21st century. There are approximately 18,000 students in the district. It also strongly believes in BYOD. It is indeed, financially difficult for the district to purchase devices for every student, especially when you take into consideration the life expectancy of chrome books which is, as yet, unknown, but thought to be 3-4 years. This would mean that in 3-4 years, they would need to purchase that many more, as well as having extras in the classroom and providing every teacher with one. On the interview pages are links to google forms the interviewees completed prior to being interviewed. ​St Helena Unified is a 1:1 district. Click on the link below for information from their Technology and Media Specialist, Sherri Kelly. Harvest Middle School has been doing a somewhat blended model, however, it hasn't been finely tuned yet. Year 1: there were 20 chrome books in each class. This resulted in students not bringing devices. Year 2: there were 3 chrome books in each class. This resulted in students not bringing them and also teacher frustration resulting from students not having devices and trying to borrow from other teachers. Year 3, PLAN: Centralize computer check out to the library. Have no devices in classroom except two or three for teacher to use at his/her discretion. Students MUST check out devices from library prior to first period. Also, do a survey in the first 1-2 weeks of school to find out exactly what type of device a student has to ensure that every student has one. NapaLearns oversees the big picture of implementing devices into the district. Made-up of educators, Silicon Valley ex-pats and local business people, they bring tech experience and knowledge to the district. They also want Napa Valley students to leave school being able to work in the 21st century world. 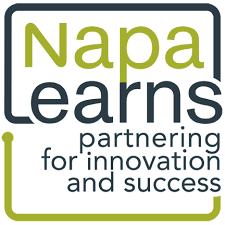 NapaLearns takes on overarching projects to support the district in moving forward with its technology implementation such as helping with network problems, training teachers, implementing BYOD and fundraising.